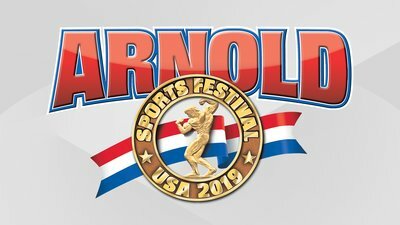 There's no showplace like the Arnold Sports Festival! The 2019 event, set for February 28-March 3 in Columbus, Ohio, promises quite a show. For the women's divisions, it's a land of opportunity, with openings for advancement in all lineups of the Fitness, Figure, Bikini, and Women's Physique International competitions. The Arnold is the only tier-1 show in the Olympia Qualifying Series, meaning that the top finishers earn more qualification points than at other events. It's also a big-money show relative to other events on the IFBB circuit. Still, a reigning Olympia champ is often strategic about whether or not she comes back to the Arnold. You can give your body a break and, perhaps, avoid the risk of losing, or you can keep that engine going full steam and go for the gold and glory. That includes an unforgettable moment centerstage being interviewed by the contest's namesake and co-promoter, Arnold Schwarzenegger—hard to pass up. With two Olympia champs competing in Columbus, predicting is a little easier this time, but it leaves the other two lineups open for educated guessing. More than a few athletes from the top ranks are sitting out the early season, so it's mostly a question of who will move up. If you're taking notes, here are some likely scenarios. Whitney Jones broke though the ranks in 2018, taking the spotlight from four-time champ Oksana Grishina with big wins at both the Fitness International and the Olympia. I don't see her stopping now. The veteran athlete, who endured difficult neck surgery before her triumphant sweep of the top shows, displays a balanced, solid physique and a generator's worth of energy in the routines. No one in the lineup is going to pose too serious a threat to her title here. Two words: Ryall Graber. Like Jones, this Canadian bombshell leapt to the front of the lineup recently, finishing second at the 2018 Olympia, where the judges said she had the best physique. With a strong routine to match her shape, Graber should occupy the runner-up spot in Columbus, as well. Another Canadian, Missy Farrell, moved boldly onto the scene with a fourth-place finish at the Olympia last year, and she could well make the Fitness top three here. Ditto for Britain's Kate Errington, who took second at the Fitness International in 2018 but dropped to 11th at the O.
Eleven fitness athletes are scheduled to hit the stage at the Greater Columbus Convention Center. Jaclyn Baker and Tiffany Chandler are the pair most likely to round out the top six, but don't count out Aurika Tyrgale, Emma Paveley, Sara Kovach, Allison Ethier, or Danielle Chikeles. Any one of them has the right stuff to move into the spotlight. She's won the Figure Olympia twice—and almost every other big-name show you can think of—but the Figure International title has eluded Cydney Gillon. That was mostly due to the efforts of two-time champ Candice Lewis Carter, who kept Gillon from taking the big prize in Columbus in 2018. The pair have been going back and forth for a couple of years, but now with Lewis Carter retiring, the path is free for Gillon to fill that hole in her trophy case. Nadia Wyatt had a standout year in 2018, winning the St. Louis Pro and smashing into third at the Olympia, where she looked fuller and sharper than in the past and left no doubt that she's one to watch out for. Can Wyatt catch Gillon in Columbus and upset her plans? Not likely—Gillon has the more dramatic overall shape—but if the front-runner slips, Wyatt will be ready. Jessica Reyes Padilla polished her presentation so much over the 2018 season, she moved into fourth at the Olympia after getting ninth at this show. If she keeps it up, a top-three finish can be hers this time. Carly Starling-Horrell, fifth at the O, is another candidate likely to finish in the money, which at this competition means the top six. Others in the 15-woman lineup who could make that cut include Sandra Grajales, Natalia Soltero, Bojana Vasiljevic, and Maria Luisa Baezea Diaz, all of whom have gotten some love from the judges in the past. With Angelica Teixeira not coming back to try for win number three, look to the top placements from the Olympia and last year's Bikini International for her possible successors. In this case, the second- and third-place finishers from the Olympia will be onstage in Columbus, looking to impress the judges. The nature of bikini, however, is that any lass with sass—and just enough conditioning—can rise from the ranks to gain the crown. That said, Lauralie Chapados and Janet Layug have got to be the front runners. Chapados pulled off a trio of prestige wins last summer at the Toronto, Chicago, and Tampa events before strolling past Layug into the runner-up slot at the O, which gives her the edge, theoretically. Layug is a veteran who hasn't lost her snap with the judges and she's been second at this show multiple times. I like Layug's overall shape a little better, but it will come down to conditioning, which is where Chapados beat her the last time. Who Will Rise in the Ranks? With 18 top athletes on the roster at the Bikini International, there are more than a few possible contenders. The absence of familiar faces like Jennifer Ronzitti and Romina Basualdo from the lineup suggests continued upward mobility for Elisa Pecini, fourth at the 2018 Olympia, as well as Camile Periat and Breena Martinez, experienced performers who have done well at the Bikini International in the past. It also suggests a chance for Ashley Kaltwasser to improve on her fifth-place Olympia finish. Kaltwasser is a former three-time Olympia champ and has won this show twice, but her return to the stage after some time off is still a work in progress. Really, the game is wide open as to who could sneak into the top six. But as mentioned, that's the nature of bikini. The judges like to keep it fresh and new, but their standards remain high. This contest has seen a new champ every year since its inception in 2015 and that tradition will continue in 2019 as the current titleholder, Shanique Grant, is not competing. Still, you wouldn't call it a wide-open competition—not with Natalia Coelho waiting in the wings. Second to Grant at the 2018 Women's Physique International and the 2018 Olympia, she's ranked number two in the world and for good reason. Coelho is still in her early 20s and carries more size and conditioning than most of the athletes in this lineup, and she's got the symmetry and proportion to back it up. This contest is hers to lose. Amongst the 24 Physique women, many are new names from around the world, some not so well-known. I for one can't begin to tell you who will finish second. Margita Zamolova was third in this show last year, and she has the size to hang with Coelho, but someone with a more aesthetic package could keep her from moving up. Penpraghai Tiangngok placed eighth at the Olympia and she could be the one to do so, but she presents a smaller package. She would have to be on point, condition-wise, to make a dent. I also like the potential of the Czech Republic's Lenka Ferencukova, who was a promising amateur and is just coming into her own on the pro level. The bottom line: Your educated guess is as good as mine when it comes to predicting the highly-anticipated Arnold events! Let me know your thoughts in the comments below.